All birds need special places to survive and reproduce. Some travel great distances to enhance their chances of survival. Kuwait is extremely important for birds, both to many migratory species and to resident species of the wider Arabian Desert and Gulf coast. The State of Kuwait lies at the northwestern end of the Arabian Gulf with the vast arid Arabian peninsular to the southwest and the Mesopotamian delta to the northeast. Though predominantly a desert landscape and relatively tiny in area (about 18,000 km2), Kuwait is remarkably rich in birdlife and, as a result, steadily gaining attention and respect from nature enthusiasts and ornithologists. The large number and variety of birds found here can be attributed to Kuwait’s unique location at the heart of several important bird migration routes, among them the Eastern Flyway connecting Eurasia and Africa. As migrating birds travel across the region, south in the autumn and north again in the spring, they must cross challenging environments such as deserts, steppes and open seas. Finding suitable habitats for resting and refueling is critical for their survival. Kuwait’s available habitat sanctuaries, centrally located as they are in the migration corridor, act as magnets for migrants and vital staging areas for these seasonal mass bird movements. Indeed, despite being dominated by a flat and stony desert with no rivers or natural lakes, Kuwait’s landscape is far from lifeless. Its location at the confluence of three distinct ecoregions –the Arabian Desert, the subtropical Gulf coast and the Mesopotamian Delta– means that on a local scale Kuwait has a variety of biodiversity-rich habitats. Its marine waters and tidal coastlines are some of the Gulf’s most biologically productive, being fed by the nutrient-rich delta plume on the vast tidal estuary of the two great rivers, the Tigris and Euphrates. And unlike other Gulf States, Kuwait has a surprisingly seasonal climate with a distinct cool and often a relatively moist winter period. After ephemeral autumn and winter drizzles, deserts may bloom and depressions temporarily transform to living wetlands, richly inviting for birds. This unique seasonal climate reminds us that Kuwait is also on the fringe of Mesopotamia’s Fertile Crescent, where historically the semi-deserts have been important grazing grounds for wildlife and domesticated livestock. Furthermore, despite Kuwait’s arid backdrop, sporadic oases have always existed along the coast. But in recent times desalination and sewage treatment facilities have begun providing abundant water for inland agriculture and fueling small artificial wetlands, resulting in an even more extensive network of man-made oases. In this flat, sandy landscape, these oases serve to attract migrant birds and other wildlife. Even in urban areas such as Kuwait City, a relatively recent social drive to “green” the country is resulting in small pockets of congenial habitat for many bird species. 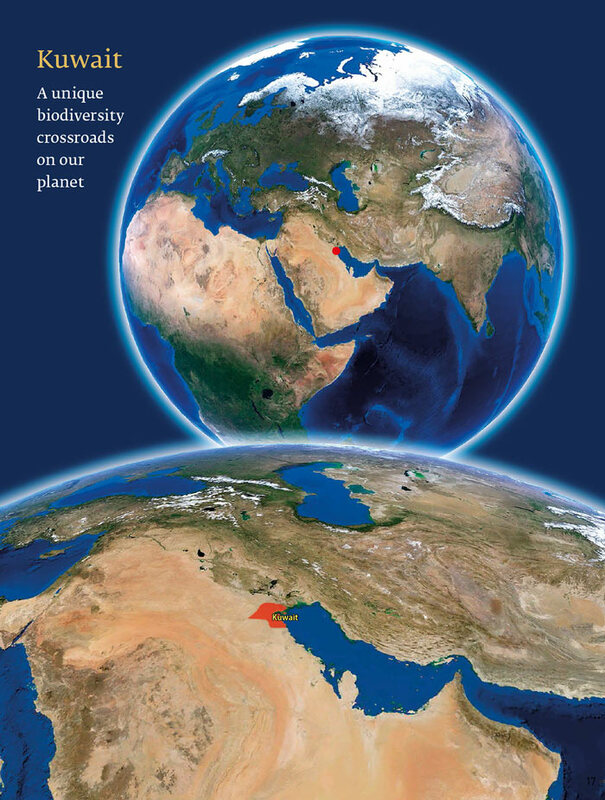 Kuwait is also gaining importance for international ornithology due to recognition of its unique position between three major zoogeographic regions, the Western and Eastern Palearctic and the Afrotropic realms. The Western Palearctic includes all of Europe, parts of the Middle East and North Africa. And although its exact boundaries do not have universal validity, its distinct assemblage of western Eurasian birdlife is widely accepted. This vast region hosts about 1100 species of birds – many of which are transients and vagrants, visiting from surrounding regions of Asia and Africa. Situated at the far eastern boundary of this region, Kuwait has the unusual privilege of seeing avian visitors from adjacent zoogeographic regions. Many species from the Indomalaya and Afrotropic realms also penetrate Kuwait’s territory – many of which are seldom seen anywhere else in the Western Palearctic. In addition to its diverse avifauna, Kuwait’s appeal to birders and naturalists includes the fact that its outstanding wildlife habitats can be found conveniently nearby to Kuwait City. Within less than two hours travel by car (or boat) from the city, one can reach any of the country’s varied habitats, each capable of offering good birding opportunities. In this book we show photographs of birds in the wild in Kuwait, at areas that are extremely important for their populations but in many cases very close to the urban environment. For example, both the southern and northern shores of Kuwait Bay are globally important sites for flocks of shorebirds and flamingos. Bubiyan Island and the tiny offshore islets off Kuwait’s coast host important seabird and waterbird colonies, including one of the world’s largest concentrations of nesting Crab-plovers. The nearby desert sustains relict wilderness landscapes, complete with beautiful low-lying escarpments that host range-restricted birds unique to the southwest Asian deserts. And right next to Kuwait City are some farms, irrigated fields and tiny artificial wetlands that have become famous sanctuaries for rare migrant birds. The proximity and variety of potential birding sites within easy reach of Kuwait City is attracting a steadily increasing flow of ecotourists, people who visit a country to enjoy its outdoors, particularly during winter and the spring bird migration. For the first time in its history Kuwait is becoming an ecotourist destination for adventurous birders and nature travelers. Here naturalists can easily sample the local biodiversity – while much of the wider Middle Eastern region remains difficult to access for foreign visitors.